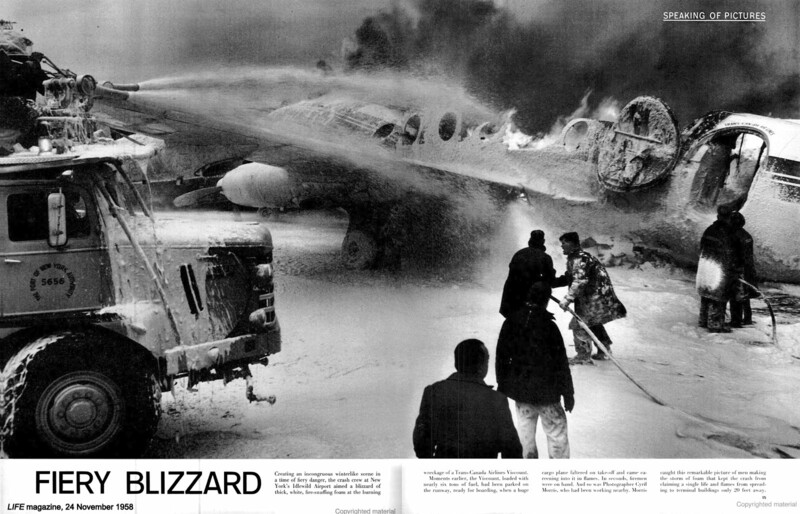 A photo featured in LIFE magazine, 24 Nov 1958 had the caption: "Creating an incongruous winterlike scene in a time of fiery danger, the crash crew at New York's Idlewild Airport aimed a blizzard of thick, white, fire-snuffing foam at the burning wreckage of a Trans-Canada Airlines Viscount." "Moments earlier, the Viscount, loaded with nearly six tons of fuel, had been parked on the runway, ready for boarding, when a huge cargo plane faltered on take-off and came careening into it in flames. In seconds, firemen were on hand. And so was photographer Cyril Morris, who had been working nearby. Morris caught this remarkable picture of men making the storm of foam that kept the crash from claiming a single life and flames from spreading to terminal buildings only 20 feet away." Federico Cavedo found some more photos in the LIFE photo archive of the aftermath of the fire, taken by LIFE photographer Robert Kelley. They show what appears to be a number of empty cans of foam concentrate, lined up to try to contain the foam around the TCA aircraft. 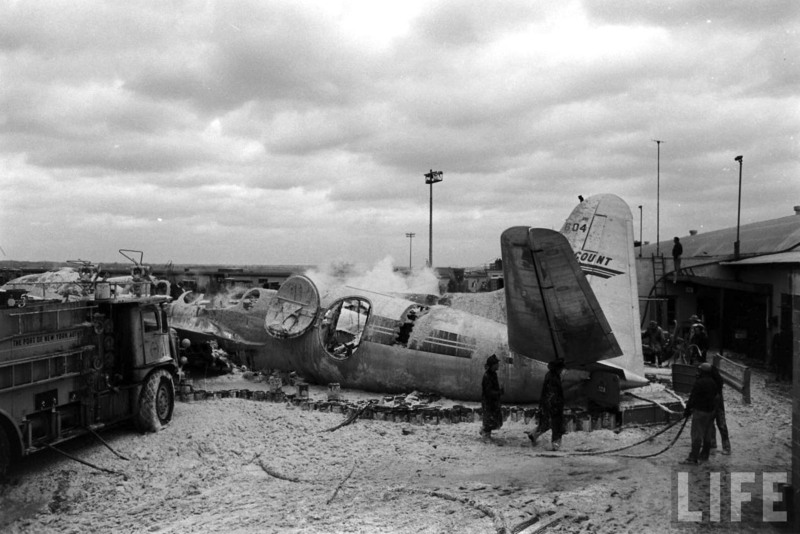 A report at aviation-safety.net states that a Seaboard & Western Airlines Super Constellation was taking off at Idlewild (now JFK International) on 10 November 1958 when it became uncontrollable. The aircraft finally struck the unloaded Trans-Canada Airlines Vickers Viscount, which was preparing to board passengers. 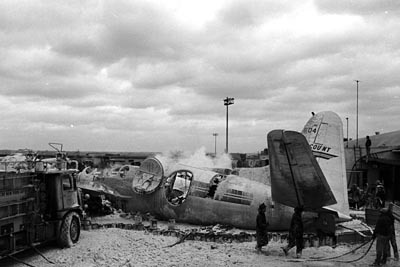 Both aircraft were destroyed by fire. 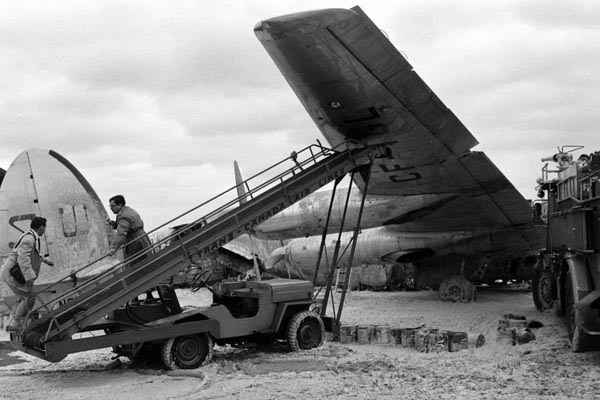 A TCA baggage-loader CJ-3B was brought in, apparently to stabilize the wreckage. In this photo it's being used by a couple of gentlemen who seem to be examining the tail of the S&W Super Connie. It's hard to know what they're looking for; the only thing we know for sure is that they rolled up their trousers to keep them out of the foam. All five crew on board the S&W flight, and two crew on board the TCA Viscount, survived. The probable cause of the accident according to the aviation-safety.net report was "an unwanted propeller reversal at a low altitude occurring immediately after takeoff. A contributing factor was the inadequate overhaul procedure employed by the propeller manufacurer." 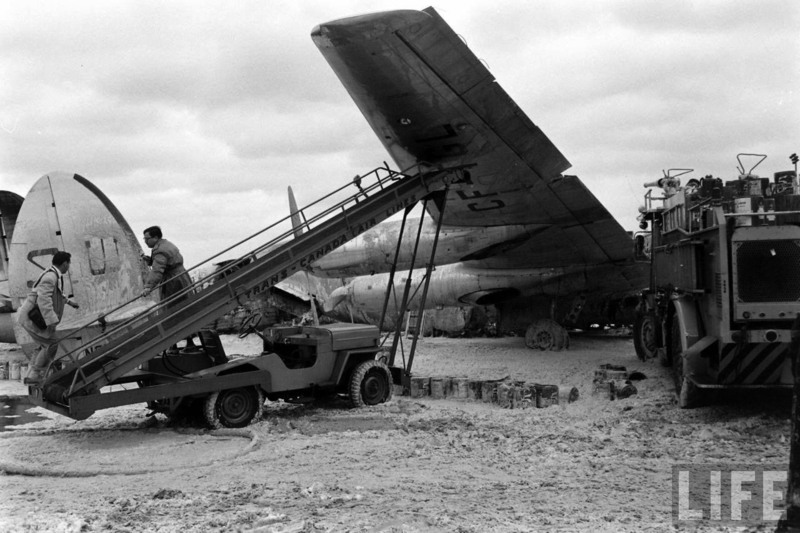 See Airport Jeeps of the 1960s on CJ3B.info. See also Fire Service Jeeps.